You'll be greeted at the door by one of our experienced members of staff, who will help to make you feel welcome, and put you at ease if you're at all worried about anything. 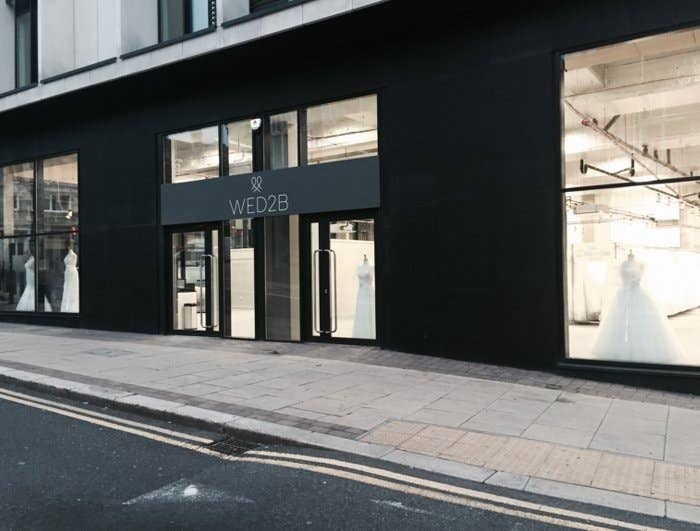 They will then explain our process of choosing dresses; once you've been given a card with your name on it, you'll be free to browse our enormous range of designer wedding dresses, which includes the four exclusive collections you can view on our website. Milton Keynes VIP day launch. If you're not sure what you're looking for, our staff will be happy to offer advice and suggestions based on the styles you like and what suits you. All our dresses are arranged in size order from 6 to 30, so it's easy to find the ones in your size. Don't be discouraged from trying on a bigger dress - you may find the perfect dress in a size bigger than you normally wear, but most of our gowns can be taken in up to two dress sizes! 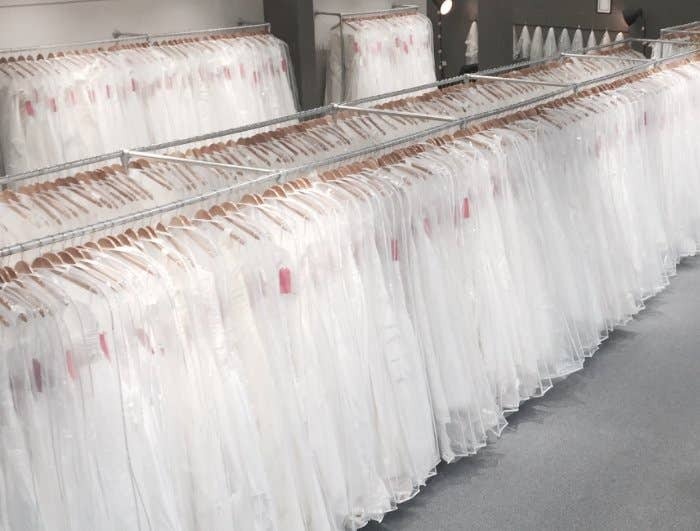 Over 1,000 dresses to choose from at each of our stores. We'd also advise that you keep an open mind when it comes to choosing styles to try. While you may have a clear picture in your head of what you want your dream wedding dress to be, it's still a good idea to be a bit flexible, as you may end up falling in love with something you'd never have considered before! WED2B stocks gowns in a variety of styles, including A-line, ballgown, tea-length, fishtail, and more, so don't be afraid to try something new. 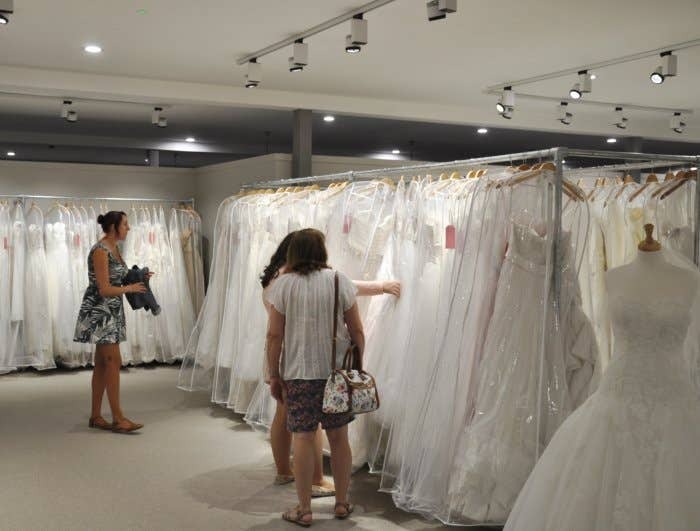 Once you've found your first dress, you can hand it over to one of our sales advisors along with your name card, and they will put you in the queue for the changing rooms. You can try on up to four dresses at a time, so once you're in the queue you can choose the other dresses at your leisure. Your entourage is more than welcome. When you're ready, you can take a seat in our waiting area until one of our spacious changing rooms is free. 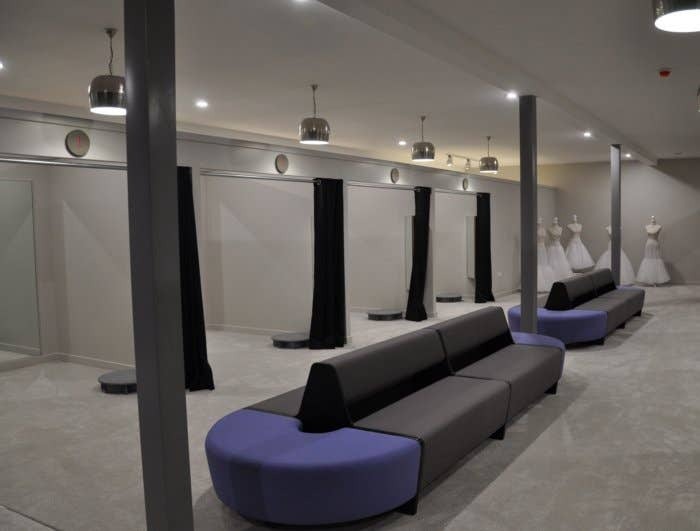 If you've brought friends or family with you, then they will be able to sit outside the changing rooms and offer their opinions on the dresses when you're ready to show them off. 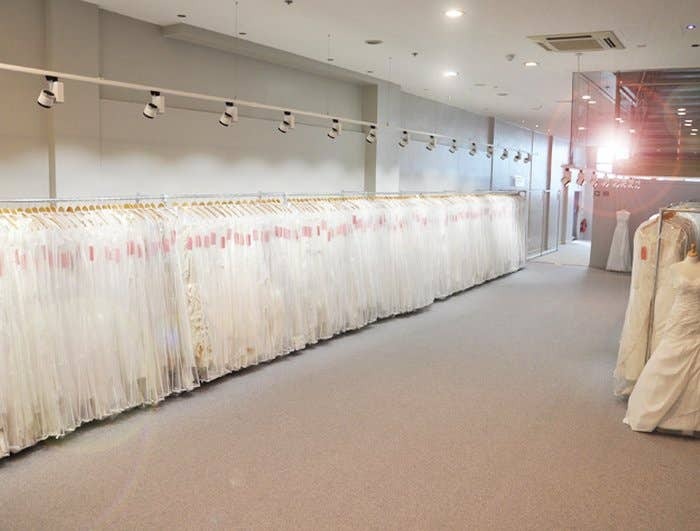 A member of staff will be on hand to help you in and out of each dress, as well as make suggestions for underskirts and accessories that could go with each one, and offer advice for styles and shapes. If a dress doesn't fit, they will be happy to find you one in another size. A wide range of accessories to choose from! 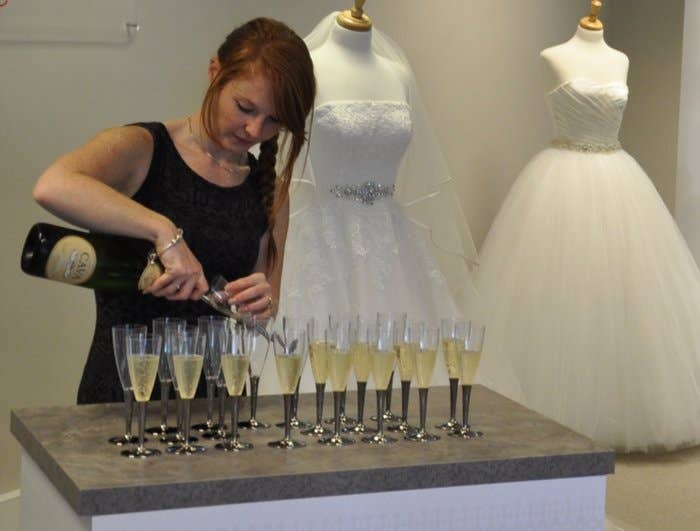 We encourage you to try on as many dresses as you like, as we know how important a decision you'll be making! If you don't like any of the first four you try, you're welcome to go around the store again and choose some more. Once you've found The One (and taken lots of pictures! ), you can pay for it there and then and take it home with you on the day. You'll also have the option of purchasing a breathable fabric dress bag, to store your dream dress in perfect condition leading up to your big day. When you find "the One" you just know! At WED2B we pride ourselves on being different, and we hope this guide has shown you what you can expect when you visit us!